Tri-Cities employers added 2,000 nonfarm jobs in February pushing the region’s growth rate trend higher for the second month this year. The job-creation trend bottomed in December after a nine-month decline. 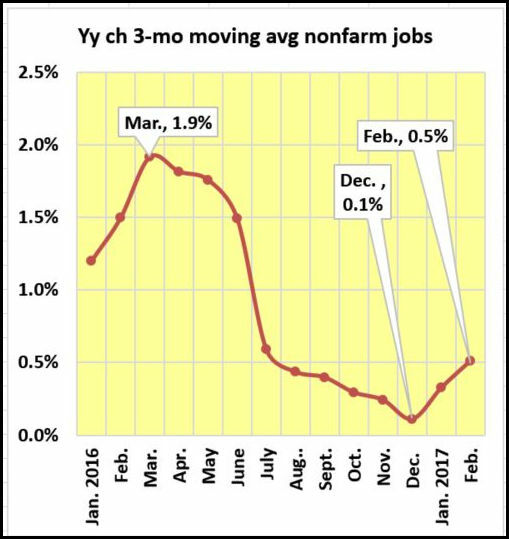 During that time jobs were still being added, but the three-month moving average signaled the recovery that began in June 2015 and peaked in the early months of 2016 was running out of steam. Preliminary, non-adjusted Bureau of Labor Statistics numbers in the February payroll report show the nonfarm total 1,500 jobs higher than in February last year and 800 jobs off the 2016 annual total. It’s noteworthy that February’s jobs growth was not evenly distributed across the seven-county region. Johnson City Metropolitan Statistical Area (MSA) employers added 1,300 jobs while those in the Kingsport-Bristol MSA added 700. February’s report was a continuation of an upswing in the growth rate in the three-county Johnson City MSA and a decline in the four-county Kingsport-Bristol’s. The Kingsport-Bristol trend line has arched downward for 11 months. Job creation trends in the metro areas began moving in opposition in November. Kingsport-Bristol’s year-over-year growth rate dropped into negative territory in December. Kingsport-Bristol labor sectors showing the best growth when compared to February last year were Leisure and Hospitality; Professional and Business Services and Construction. Manufacturing and the Information Sector continue to be the sectors with the biggest losses. Professional and Business Service and Financial Activities were February’s growth sectors in the Johnson City MSA. Sectors with the weakest performance were manufacturing and government. Employment from the BLS’s household report shows monthly increases in the seven-county region, but it’s trending lower when compared to last year. A positive is the labor force is not following suit. Its growth has slowed, but it has not gone negative for 13 straight months. On the MSA level, Kingsport-Bristol’s three-month moving average trend turned down in September and moved into negative year-over-year territory in February. 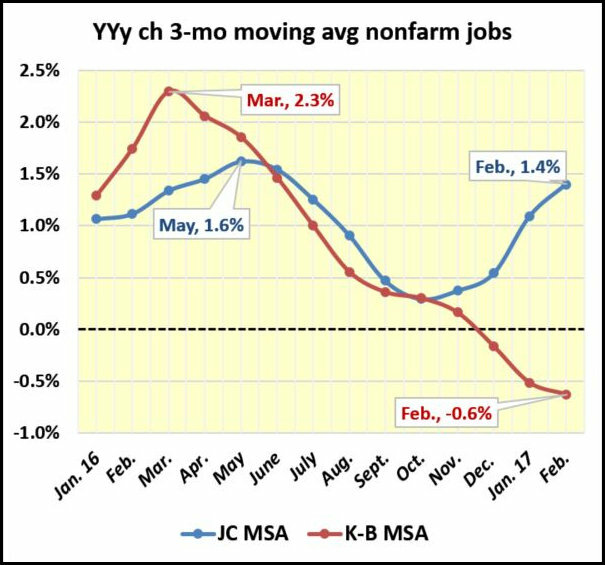 The Johnson City MSA trend posted its third straight month in a downward arc. But February’s performance was a respectful 1.6% gain. It peaked in October last year with a 1.9% gain. Nonfarm jobs – up 1,500 from Feb. last year. Recovery status – 1,900 fewer than the pre-recession benchmark. Employment – down 907 from Feb. last year. Recovery status – down 19,676 from the pre-recession benchmark. Labor force – up 69 from Feb. last year. Recovery status, down 22,096 from the pre-recession benchmark. Feb. unemployment rate 5.3%, down 0.8% from Jan.
Nonfarm jobs – up 1,300 from Feb. last year. Recovery status – down 200 from the pre-recession benchmark. Employment – up 335 from Feb. last year. Recovery status – down 10,319 from the pre-recession benchmark. Labor force – up 866 from Feb. last year. Recovery status – down 10,056 from the pre-recession benchmark. Feb. unemployment rate 5.5%, down 1% from Jan.
Nonfarm jobs – up 800 from Feb. last year. Recovery status – down 1,700 from the pre-recession benchmark. Employment – down 1,362 from Feb. last year. Recovery status – down 9,649 from the pre-recession benchmark. Labor force – down 9542 from the pre-recession benchmark. Feb. unemployment rate 5.2%, down 0.7% from Jan.
Employment – down 125 from Feb. last year. Recovery status – down 1,163 from the pre-recession benchmark. Labor force – down 107 from Feb. last year. Recovery status – down 1,097 from the pre-recession benchmark. Feb. unemployment rate – 5.1%, down 1.1% from Jan.
Employment – up 269 from Feb. last year. Recovery status – down 1,554 from the pre-recession benchmark. Labor force – up 434 from Feb. last year. Recovery status – down 1,570 from the pre-recession benchmark. Feb. unemployment rate – 4.7%, down 0.8% from Jan.
Employment – down 198 from Feb. last year. Recovery status – up 3,260 from the pre-recession benchmark. Labor force – down 58 from Feb. last year. Recovery status – up 3,300 from the pre-recession benchmark. Feb. unemployment – 5.7%, down 0.8% from Jan.